And I mean literally. 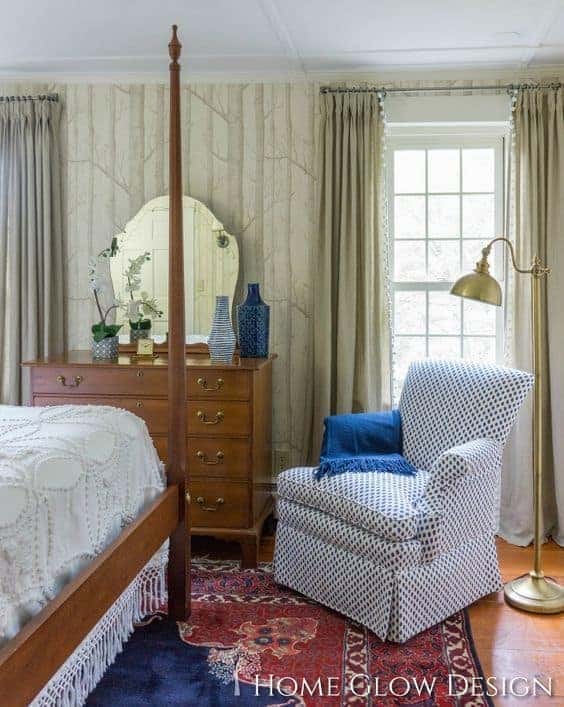 In its May issue, the ever-au courant Vogue magazine actually gives nine tips on why and how you should “Steal Your Grandma’s Style.” So, while I have always loved traditional Granny Chic and have incorporated a number of style elements in my own rooms, now, at last, it is a cool thing to do. Gone are the days of having all your case pieces in one finish — mahogany, cherry, “espresso” (go read Emily Henderson’s thoughts on that. Ha! ), black, or white. 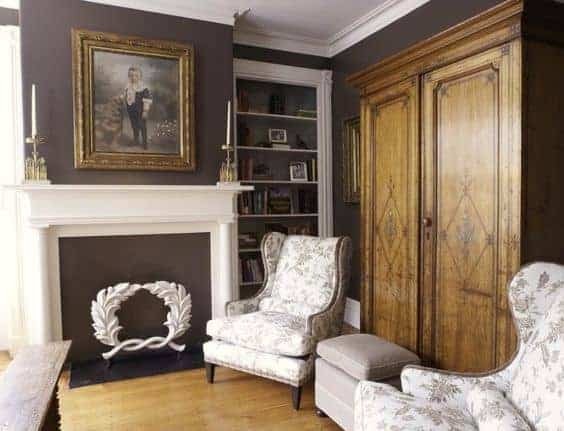 Having one or two colored pieces in a room keeps things fresh and moves your eye around, be they old ones that have been painted or new ones with great lacquered or other factory finishes. To that end, just about everyone — magazine, blog, DIY show on TV — has said “take that old vintage piece and paint it to give it new life!” And, to a certain extent, I agree. Old rock maple furniture from the ’60s — paint it! Looks great in kids’ rooms and is wickedly heavy-duty. That old cherry hutch, china cabinet, or corner cabinet — paint it! You have a fun entry or kitchen piece. That yellowed, country pine coffee table from the ’90s…you get it. However, I feel that incorporating some brown furniture into your rooms helps keep everything grounded. Not only grounded visually, but grounded in a more emotional sense as well. Patina, shine, rich veneers — these give your rooms a sense of collectedness, attachment, history, and above all, taste! Some of you may be able to afford 18th century antiques. I can’t. But what I can afford right now took our grandparents years of saving. They spent thousands on fine quality reproductions. These reproductions from the ’50s and ’60s, many of which are in EXCELLENT condition, now cost only hundreds on Craigslist, in consignment shops, and at auction. So many people just don’t seem to want heirlooms anymore. They want stuff that is cheap and will be in the landfill in five years because it is going to break down (See this article in the Wall Street Journal. So much for being environmentally conscious.) But their stupidity is your gain, my friend. “But I don’t want to live in a museum!” you say. Well, take, for example, a couple of my own rooms. Transitional elements — fresh green blue, curved ottomans, Cole & Son’s Woods wallpaper, and a small ikat print fabric — keep things lively while the brown gives depth and richness. Also, though neither of the above rooms have any painted furniture, I did mix up my woods — mahogany (sideboard and table) and tiger maple (chairs and corner cabinet which is not shown this photo) in the dining room and cherry (bed and dresser) and cerused oak (on bedside tables which are also not shown) in bedroom. And you see that dresser in the bedroom? It actually is 18th century except for, obviously, the mirror, and it is solid cherry. All the way through. Weighs a TON. Know how much I paid? $700 at auction. Yep. 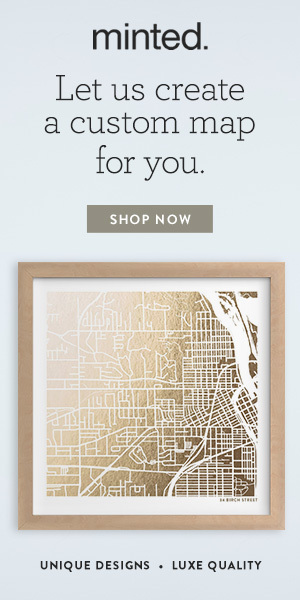 Go on Pottery Barn and see what you can buy for that amount and where it was made. The sideboard and dining chairs were from auction and eBay. Just a couple pieces like this in a room can save you bank. These companies are all still making gorgeous case goods, but I personally can’t afford the new stuff. Baker and Century have Outlets, both of which are crazy expensive but have up-to-date offerings at thousands off the original price. Elmwood Furniture specializes in vintage Kittinger furniture, including some very rare and hard to find pieces that are beautifully restored by a number of retired Kittinger artisans. There are also a few eBay purveyors who carry a number of these makers, in particular Stenella Antiques and Bucks County Estate Traders. I have never bought from these two companies, but their reviews are excellent. OR, if you have no idea how to mix these lovelies up for the fresh and life-filled family home of your own, give me a buzz. I’ll chat fine American craftsmanship ’til the cows come home. 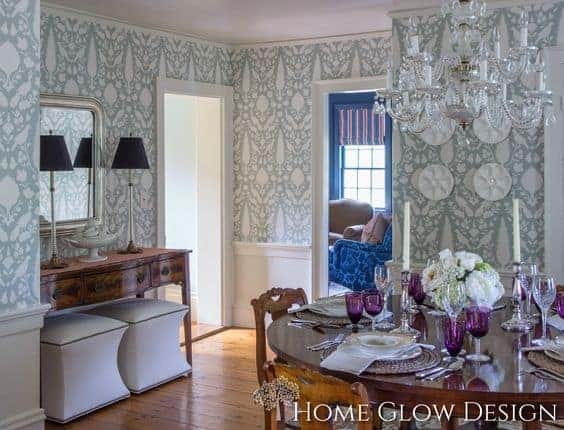 And remember, for the next 3 weeks, you will get a coupon code for an extra 10% off at Abigail’s, a fantastic resource for beautiful decor and ceramics which I featured here, if you sign up for my subscriber list! What a gorgeous post with wonderful examples of “granny’s furniture” looking fresh, stylish and youthful! And thank you so much for including our green dining room. The granny’s furniture we used is new— custom-made by a wonderful and far more reasonable source than the big names like Baker et al. The source is Englishman’s Furniture (englishmansfurnituredotcom). It is a trade only resource. Ask for Ann. She’s a doll! OMG! I just found your blog and have been devouring it! I couldn’t agree with you more on this post and I am loving all of your room reveals and posts. I spent a lot of time acquiring Baker & Century pieces from the 50s & 60s when I started furnishing my house and I keep it light and youthful with art, color, creamy white walls and a ton of natural light. Rooms without some sort of wooden case good really bum me out.